VATICAN CITY (CNS) — The last general audience in St. Peter’s Square turned into a farewell party with balloons, flowers, flags, posters, cheers, standing ovations and a touching thank-you speech from Pope Benedict XVI. Authorities estimated about 130,000 people were in attendance, most of them packed in the square, with some spillover onto the long boulevard in front of the basilica. 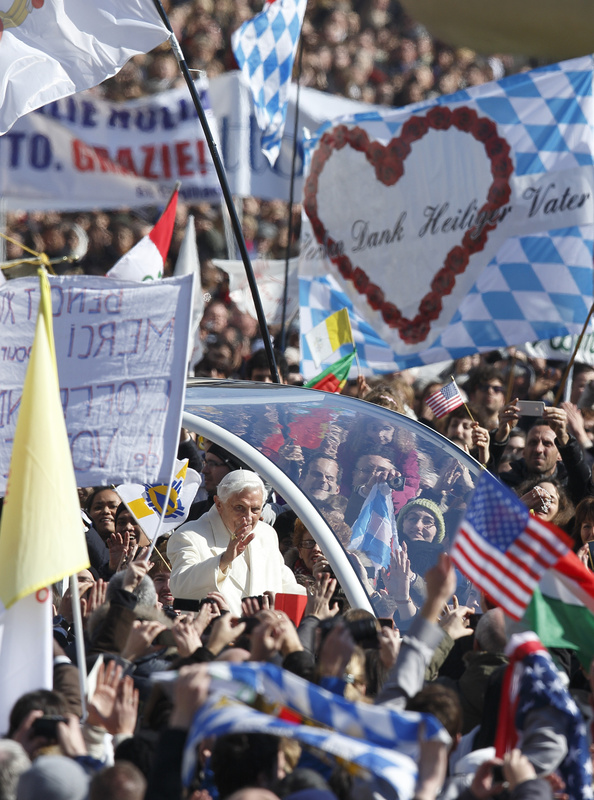 It was also the last chance for pilgrims to have religious items blessed by Pope Benedict. Many came supplied with rosaries and religious trinkets, while others quickly fumbled for their necklace pendant or their ring. The pope’s speech paid homage to God — his source of strength — and all the men and women who make up the living body of the Catholic Church. He gave his assurances that resigning as pope would not mean he was abandoning his flock, but delving deeper into spiritual union with the world through Christ. “He confirmed that the Petrine ministry is a service, first of all, for the good of the church and not a prestigious office to be exercised by one person,” said Michele Brescia, 25, of Foggia, Italy. “What hit me most was him saying that the one and only supreme guide of the church is the Gospel, the word of God, and Jesus Christ with his witness to poverty, humility and service to others,” he said. “It has to be a home for everyone, it has to be a guiding light for everyone searching for the truth,” she added. Because the pope made the decision to step down after a long period of intense prayer, “he’s so certain that this is what God wants, and it fills you with the same sense of serenity” that the pope displays, said the priest, who teaches at Rome’s Pontifical University of the Holy Cross. “His prayers are going to be very powerful, and the church needs that prayer,” he said. She said that sometimes “the tendency could be to look at the pope as a superman,” but his act of resignation could “open the door to greater changes” in the church. “I would like a pope that is comfortable with contemporary culture” and a church where different cultures are in a spirit of communion, she said. Franciscan Father Gearoid O Conaire said the pope “is moving away, but he’s not getting down off the cross,” referring to some criticism that the pope did not remain pontiff until his death. “He really reiterated that he continues to stay with Christ on the cross,” even though his life won’t be filled with travels, speeches and large events, said the friar, who is executive secretary of the Franciscans’ justice, peace, and integrity of creation commission in Rome. The pope displayed much courage “to go against 600 years of tradition and say ‘I don’t think it’s up to me now to continue,’ and his ability to step back and say ‘it doesn’t depend on me, but on Christ,’ who continues to be with the church, never abandons the church,” said Father O Conaire. Father Saverio referred to the double meaning of Benedict in Italian, “Benedetto,” which means both Benedict and blessed. “Some ‘Benedetti’ (Benedicts and blesseds) went on to become popes. This pope is leaving the pontificate to become ‘Benedetto’ (blessed),” he said. Contributing to this story was Lauren Colegrove.